Divock Origi has either scored or assisted in every game he’s started this season. Granted, he’s only started three games – but he’s at least doing his job when called upon! Against Watford on Wednesday night, the Belgian began on the left flank and put in his most impressive individual outing in a very long while. He got on the ball plenty, looked to beat his fullback, but also tracked back and supported Andy Robertson in defence. In the second-half especially, he found space down the flank on multiple occasions; during one of these he scored his lovely goal after cutting inside two defenders. 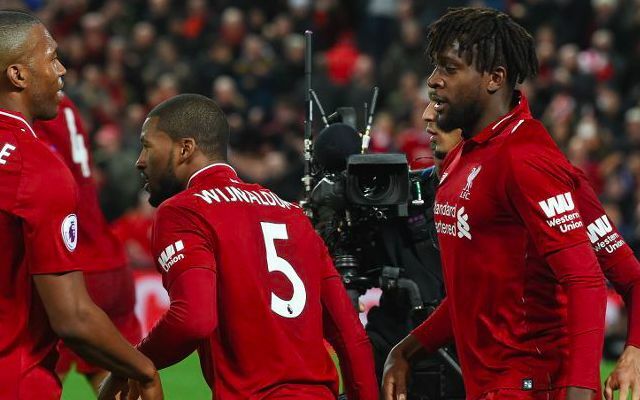 Confidence up, he even delivered a 50-yard pass with his wrong foot as Liverpool began to purr! If Roberto Firmino is fit for Sunday, you’d expect the Brazilian to start v Everton – but we wouldn’t be surprised if Origi got the nod otherwise. After all, Jurgen Klopp picks players on merit – and Divvy hates The Ev!